At age 50, Joginder Singh and 25 year old Harmit Singh are more like best friends than they are father and son. The Singh family immigrated from India to create opportunities for themselves while helping others. 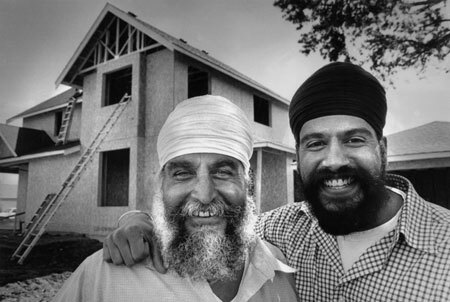 Joginder was a Sikh assistant priest before becoming a truck driver and general contractor in The Peace Arch City. Harmit travels between his computer focused career with Microsoft and living and working with dad. Sharing a common spiritual faith is credited with bringing them mutual and individual opportunities for their happiness and success. The principles of assisting others, working together peacefully, respecting elders and loving all children are commonplace among most religions and social doctrines. With an uncommon tenderness, Joginder applauds his son with having "great knowledge"
while at the same time, Harmit affectionately announces, "dad knows more than I do." In the near future they will build a larger home for both men and their respective families to share. We see that this expedient and loving coexistence conserves natural resources and daily necessities while cultivating societal efficiency and nurturing planetary survival.